St. Francis got out to a hot start leading 10-2 behind an aggressive Dwon Odom but Westlake worked its way back behind freshman Dillon Hunter who scored seven of his 11 points in the first quarter to close the opening eight minutes with the Lions trailing 23-15. Westlake’s isolation offense started to click with Rice-commit Quincy Olivari (4), Kaleb Wallace (5) and Clemson-commit Chase Hunter (4) finding the bottom of the net, but it was the steady play of 6-foot-4 senior wing D’Antaye Page that kept the Lions intact. Page netted seven of his team-high 18 points in the quarter to give Westlake a 38-35 lead at the half. Page continued to pour it on in the second half, but it was his rebounding that eliminated any second chance opportunities for the Knights, double-doubling with 12 rebounds to his credit. With Sean Paradise lost for the season with a dislocated knee, St. Francis was in search of someone to step up. Chase Ellis did just that, the reliable undersized forward totaling 21 points, 13 rebounds, 5 assists and 1 block. The Knights went back and forth with the Lions after heading into the fourth quarter down 55-53 until Westlake secured a lead midway through and continued to fend off any St. Francis efforts to regain control. Odom scored 13 points in the final frame but Olivari’s gutsy shot in the lane with 47 seconds to play proved to be the dagger, pushing Westlake’s lead to 73-68. The new-look defending Class 7A state champions clamped down on Wheeler, holding the Wildcats to 17 points in the second half to coast to victory. Wheeler led 17-16 after the first quarter and in the second quarter the game got chippy with technical fouls, jawing and a lot of clapping. Through all the gamesmanship, Damian Dunn (Temple) shined the brightest, dazzling in his Georgia debut. Dunn dominated on the wing, scoring at all three levels and cleaning the glass. He finished with 26 points, 13 rebounds and 5 assists, giving Meadowcreek anything they needed whenever they needed it. As good as Dunn was, it was the role players that proved to be the difference makers. Kedrick Green, a starter as a freshman, came off the bench and showed his championship mettle, collecting 2 points, 3 rebounds, 6 assists and 2 steals. Even with Green’s positive influence on the game, Wheeler still maintained a 37-33 lead at the break with Sam Hines scoring 12 of his team-high 14 points in the opening half. 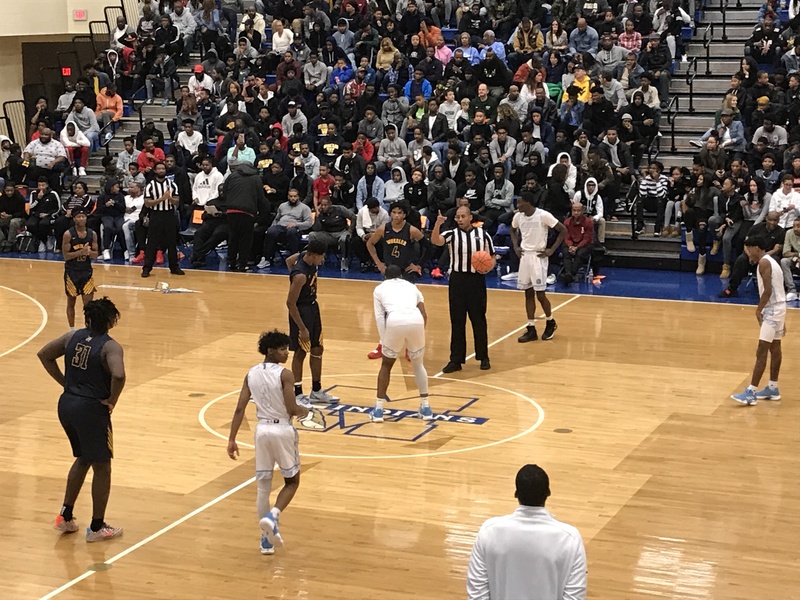 The Mustangs and Wildcats traded body blows in the third quarter before Meadowcreek stole momentum with the three-ball to quickly distance themselves from Wheeler. The Mustangs hit four threes in a row to close the third quarter, senior Emmanuel Collier drilled two of his five during the stretch while Corey Blissett added one and Dunn sank a contested leaner at the buzzer to balloon the lead to 55-47. Collier finished with 17 points, sniping from the corner as Wheeler failed to run him off his sweet spot. Dunn and Jamir Chaplin combined for 11 points in the fourth quarter, outscoring Wheeler (7) by themselves to kick off their title defense with a win. Nip-and-tuck until the final buzzer, Class 7A No. 2 McEachern used a late 9-0 spurt to race past GISA superpower Holy Spirit Prep and stun the Cougars in front of a capacity crowd. McEachern held an 18-17 lead after the first quarter behind a balanced attack that saw Sharife Cooper score seven points and Isaac Okoro (Auburn) and Jared Jones (Northwestern) add four apiece. Consensus five-star junior Anthony Edwards had a quiet start for the Cougars and elected to get his teammates involved instead of hunting his shot. Edwards had two points and two assists with Ahmir Langlais scoring six points inside. In the second quarter, Edwards and DeAndre Brown got hot. The duo combined for 16 points, hitting three three-pointers between them and grabbing a 30-24 lead at the 3:36 mark. The Cougars settled for a 33-31 lead at the half. In the third quarter, Edwards continued to break away after Okoro did a nice job defending him to open the game. Three rim-rocking dunks highlighted by one right before the buzzer gave Holy Spirit Prep a 50-48 advantage heading into the fourth. The Indians stuck tight with the Cougars and weathered the Edwards storm the best they could in the third behind Cooper’s slick passing and Okoro’s attacking play. Alyn Breed (4) and Quinton McElroy (5) came up huge in the quarter to give Coach Mike Thompson some offense from his fourth and fifth scoring options. Holy Spirit Prep was in good shape in the fourth quarter even though Langlais hardly saw the floor with foul trouble. The Cougars led 61-55 before Cooper flipped the switch and scored his first points since the first quarter at the 4:28 mark to cut the lead to four. Hemmed up for two quarters struggling to finish in the lane and settling for setting up his teammates, Cooper began to take over. He tied the game at 61 but Ibrahima Jarjou hit a jumper and two free throws as the Cougars clung onto a 65-63 lead with 2:22 left before the levee broke. Cooper exploded and ignited a 9-0 run to shellshock the Cougars, burying a three to give the Indians the lead for good before Breed scored on a putback to all of a sudden give McEachern a 68-65 lead with just 94 precious seconds remaining and the crowd frenzied. 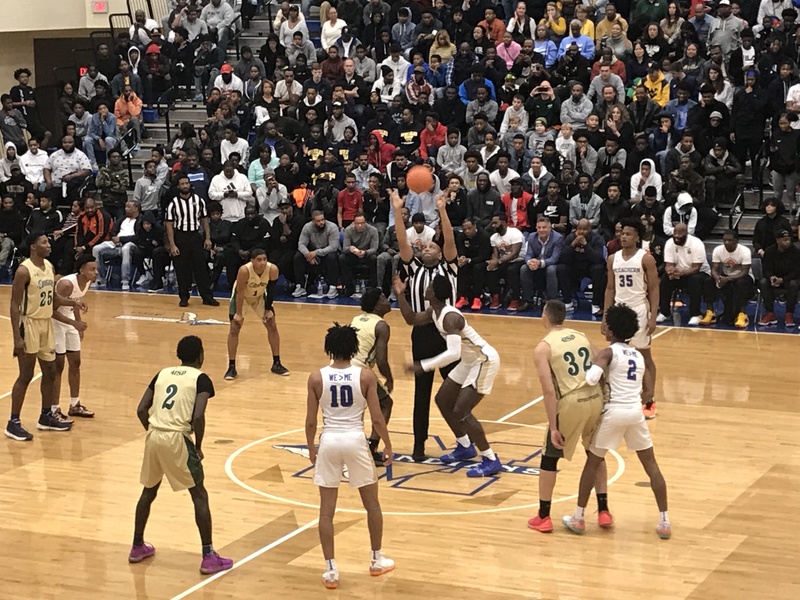 The sudden deficit and the atmosphere rattled the Cougars as Holy Spirit Prep rushed quick shots and abandoned the offense settling for pull up threes which led to easy breakouts for the Indians, McEachern capping off their run to take an insurmountable 72-65 lead with 30 seconds remaining. Cooper finished with a team-high 23 points, dropping 16 in the fourth quarter. A Brown three at the buzzer wasn’t enough as McEachern survived a 31-point outburst from Edwards.